Etusivu / Turbomatic Pro cabinet dryerTiedustelut sähköpostin kautta. Turbomatic Pro cabinet dryerTiedustelut sähköpostin kautta. 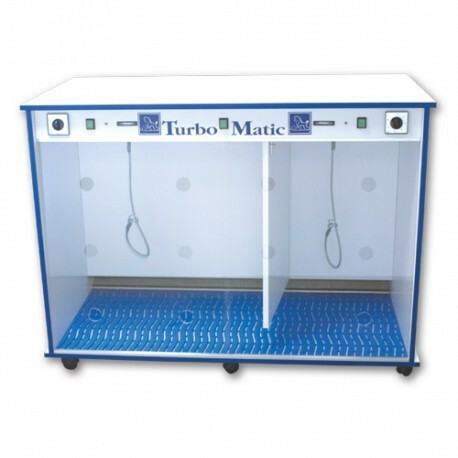 The IdealDog Turbomatic Pro (luminous) V3 cabinet dryer offers numerous possibilities. You can either dry a small, a medium or a large dog or even 2 dogs simultaneously. You simply turn on the section you need to use and so you save energy. The 2 heat elements are controlled by a thermostat preset at 38°. The technical parts can easily be accessed by a professional if necessary. In order to avoid accidents, the electrical section can neither be reached by the dog or the groomer. Equipped with 6 casters the cabinet dryer is very easy to move and very stable. Its height enables to use it as a worktop. The plexiglas sliding doors are mounted on runners to make them easier to open. 2 ADJUSTABLE STRAPS AND A RESISTANT, WASHABLE AND REMOVABLE PLASTIC FLOOR MAT INCLUDED. WARNING : this cabinet dryer is absolutely not a waiting area. The dog must be under surveillance.